Nighttime view of the San Francisco Peaks from the northwest on the rim of Walker Lake crater, located north of the junction of Hart Prairie Road and FR 418. 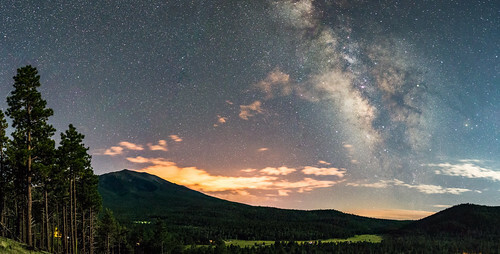 Humphreys Peak, the highest point in Arizona at 12, 633 feet in elevation, is the foremost peak in view. Photo taken August 26, 2017 by Deborah Lee Soltesz. Credit U.S. Forest Service Coconino National Forest. Learn more about the Coconino National Forest.